No Fenders -Formula 1, IndyCar and A Whole lot more..: Welcome Back Memo! Listening to Memo Gidley on Duh Freaks a few weeks prior to Christmas, I was struck with two immediate thoughts. One, what an awesomely NICE GUY Memo is! And secondly, was it really 24yrs ago when I first discovered him and his 'Uber Driving talent; Oh My Freakin' Gawd; Hya! 'Whale its funny Ha-Ha, how it feels like 24yrs ago, since apparently it was only 14+ years ago instead - as I still recall adding Memo to my CART Fantasy Racing team after his superb runner-up finish for thy 'Cheepster (Chip Ganassi) 'Wayback in 2001; YIKES! Memo capped his best result that season second time out with a points paying 11th place finish for Walker at Cleveland's Burke Lakefront "Aerodrome" before later finishing out the remainder of the season for Payton Coyne Racing. Gidley next drove for (Players) Forsythe Racing at the beginning of 'Y2K, emulating someone later known as "Suitcase Servia," i.e. ; taking rides wherever available, as "Pat-the-Carpenter's" (Patrick Carpentier) substitute for three races before finishing out the season for the Minnowesqe Della Penna Motorsports. Memo's breakout year came in '01 when he replaced Nick (Nicolas) Minassian at Target Chip Ganassi Racing, with record bests of two runner-up finishes at Cleveland and Laguna Seca plus a third at Houston. And although Memo later made two appearances in Champ Cars for Paul "GOOFY!" 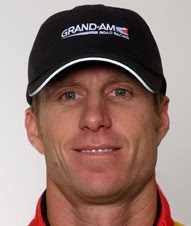 Gentilozzi's Rocketsports concern, plus a brief foray in the rival Indy Racing League, Gidley's focused solely upon Sports Car racing in the Grand Am series since 2005. Having originally read Memo's latest thoughts upon Racer.com, it was good hearing Memo's voice on Speed Freaks, where he eluded to just some of the physicalities he's gone thru since his horrific crash at Daytona nearly one year ago where he pancaked (hit) a nearly stationary Ferrari 458 Italia at 120mph; SHEISA! Two More Surgeries, Going in the Right Direction, Throttle Down! Wisely, while Memo's chomping at the bit to get back to work behind the wheel of a high powered racing car, it's good to note he seems intent upon becoming 100% physically fit before returning; noting how it takes at least one year for the back to properly fuse!